The weather is starting to warm up and we’re fast approaching summer, so it’s time for a Vitamix sorbet recipe. This is ridiculously fast and easy to make, and it’s light and refreshing. 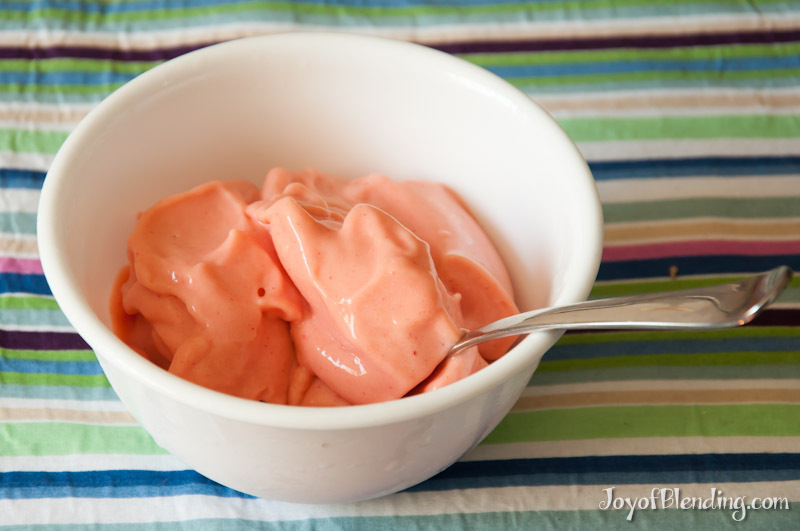 To make a Vitamix sorbet you blend an approximate ratio of 3 parts frozen items with 1 part unfrozen. In this case I used only three ingredients: frozen strawberries, frozen mango, and coconut milk. Blend on high, and use the tamper to push down the corners. Stop blending a few seconds after it starts circulating; it’ll take about 30 seconds. Vitamix likes to refer to the 4 “mounds” that will appear on the top surface, which show that your mixture has sufficiently circulated. Make sure you don’t over-blend, because it will melt. If your mixture is too liquidy, you can firm it up by adding some more frozen ingredients. If your mixture is too frozen, just keep blending a little longer and it will melt. The consistency is similar to soft-serve ice cream. If you want it to be more firm you can put it in the freezer for 30-60 minutes. You can add sweetener of your choice, but for my tastes the mango in this recipe provides enough sweetness. You could freeze your own fruit, but I was lazy and just bought frozen strawberries and mango. I’ve found Trader Joe’s to be the best source for frozen fruit and berries around here. The light coconut milk in this recipe was also from Trader Joe’s. Many of the official Vitamix recipes for frozen desserts call for a lot of ice, but that can lead to slightly less flavorful results. Instead, I like to use frozen ingredients as I did in this recipe. Another technique is to blend something up, freeze it in ice trays, and then blend it again for an extra flavorful and frozen result. Thanks for posting this, Adam. I made the orange sorbet that is in the VM cookbook and the texture was really funky. The recipe called for 4 cups of ice, which seemed to be too much. I had to turn it into a smoothie to salvage it. Your creation looks great. Will try it soon. When Vitamix recipes say “coconut milk”, are they generally referring to the stuff in a can, or the stuff you can use on cereal in place of regular milk? Thanks! I used canned light coconut milk from Trader Joe’s in this recipe. I think it would still be good if you used the carton kind, but I haven’t tried it. I am trying to make chocolate banana ice cream posted all over Pinterest. I cut bananas in 1/2″ chunks and freeze. I put the frozen bananas, chocolate powder, 1/4 cup cream and start machine and it struggles for a little while and then stops…this has happened twice…what am I doing wrong? The recipes call for frozen banana chunks, nothing else…however, that stops my machine. Machine is 5000 Series and has had little use. Thank you for your help. The other thing that can lead to overheating is blending too much at once. It does not sound like you’re doing this, but if you were to blend over 4 cups of something thick like ice cream in a single batch, that could overload the motor, even with it at maximum speed. Something like 2 large or 4 medium servings.